- This item is fixed with screws to the plywood between the box spring and mattress. - Please make sure there is something under your mattress that can fix the item with screws. - If the mattress is too thick (over 7-inch / 18cm), we suggest to purchase the 5-inch L shape accessories. - If your mattress is thicker than 11 inches, it may not fit your bed. - Each item is with 3-inch (8cm) L shape accessories by default. 1. Fits to platform bed, kid twin beds and most regular beds. 2. It is an ideal bed rails for elderly, seniors, adults to provide support when getting into or out of bed and when moving from a lying position to a sitting position. 3. A great bed rail guard for toddler, kids and child to prevent falling, which is a safe bed rail bumper. 4. Folding bed rail, you can put it down (up) by press the red button. If you have any problems, please contact us at first, and we are pleased to serve our customers. 【Bed Rail Guard】 Sturdy and Durable Aluminum Alloy (with iron) & Wooden Grain Design. 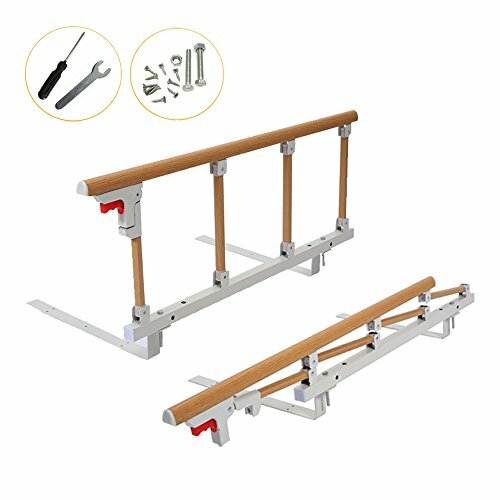 【Bed Assist Handle】 An Ideal Home Care Assistance Bed Railing for Elderly, Seniors, Adults to Get up or Turn over, Prevent Falling. 【Easy Operation】Put it Down (or Up) by Press the Red Button.